Ayse is a freelance designer based in South Devon. Graduating from Buckinghamshire University with a 3D Multi Disciplinary degree then went on to work with Estee Lauder as their corporate store designer for 10 years for UK, Ireland, Europe, Middle East and Africa. You can see Ayse’s designs in department stores such as Selfridges, Harrods and Harvey Nichols amongst many in the UK, and abroad in Istanbul, Amsterdam, Paris and Moscow. After relocating to the South Hams in 2010 she has worked as a freelance designer working for Timberland and Crew Clothing Company and, as importantly, been re united with her much loved paintbrushes. Ayse has had a fascination with wildlife and nature since childhood and has spent many hours observing the natural world. 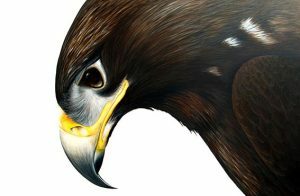 With an eye for detail and a love for birds Ayse expresses this in her paintings and drawings, working from sketches and photographs from her regular visits to a local falconer. Based in her home studio Ayse likes to work using acrylics and oils to capture each subject in as much detail as possible producing final pieces with intense realism. Recently Ayse was one of the few who was selected to exhibit at the ‘Oh Wise Owl’ exhibition which took place at the National Trust’s Beningbrough Hall, Yorkshire. 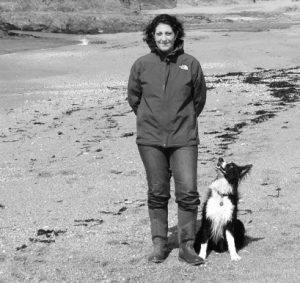 When not working or painting Ayse enjoys photography, exploring woodlands, beaches and running. She can very often be seen cloud spotting being a proud member of The Cloud Appreciation Society, or watching the sunset with her border collie, Angus, who, ever the border collie has a range of facial expressions for every occasion.